The average forecast for gross domestic product growth this year is just 2.3 percent, according to the CNBC Fed Survey for March, because of the trade battle and slowing global growth. Sixty percent still see a rate hike this year, but that's down from 78 percent in the January survey. And now 14 percent of respondents forecast a rate cut in 2019. The CNBC Fed Survey was given March 14 to 17 with 43 respondents from the economics, equities and fixed income fields. 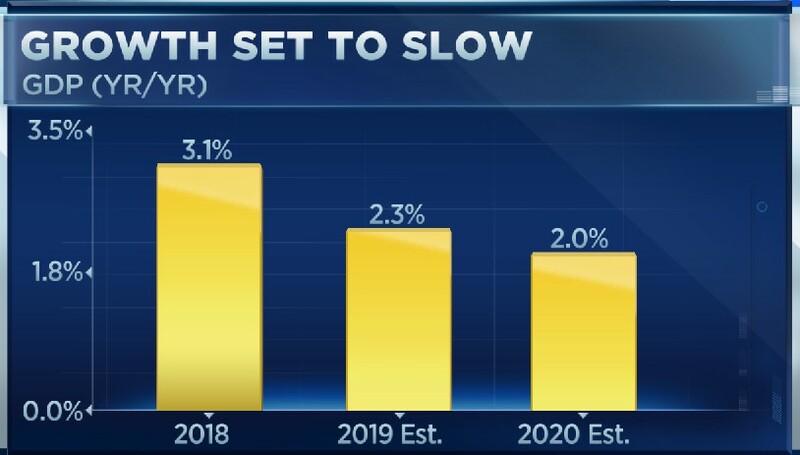 U.S. economic growth is likely to slow sharply this year and next, according to respondents to the CNBC Fed Survey for March, and weaker global growth and tariffs are seen as the major culprits. The average forecast for gross domestic product growth this year is just 2.3 percent, down from 2.44 percent expected in the January survey and a further slowing from the actual 3.1 percent year-over-year pace for the fourth quarter of 2018. Economic growth is seen stepping below 2 percent in 2020, according to the survey. The outlook for slower growth has prompted the 43 survey respondents to lower their expectations for Fed rate hikes this year and next — barely forecasting one hike and some even seeing rate cuts on the horizon. Asked about the biggest threats to the U.S. expansion, slowing global growth and protectionist trade policies ranked No. 1 and No. 2, respectively. "If Trump wants to be a two-term president, he needs to make a China trade deal and start lowering tariffs across the board," said Hank Smith, co-chief investment officer of Haverford Trust. "This will cause business confidence to rise and capital spending to increase, stimulating the economy." A weak outlook for growth abroad knocked about 40 basis points (or 0.4 percentage points) off of GDP forecasts this year, according to respondents, who include economists, fund managers and strategists. Tariffs — both those put in place by the Trump administration and retaliatory tariffs from other countries — are estimated to take another 20 basis points off of growth. The good news is that most respondents expect a U.S.-China trade deal this year. While 79 percent expect a deal, just 2 percent see a new round of tariffs and 17 percent expect a continuance. That suggests, however, that a deal could be baked into the stock market. "Ultimately … we feel a trade deal can be accomplished that neither party will love nor hate," said Richard D. Steinberg, chief investment officer of Steinberg Global Asset Management. Art Hogan, chief market strategist at National Securities, worries that tariff problems could go on even after a U.S.-China deal. "If the administration decides to pivot immediately to tariffs on European autos, any positive momentum derived from the end of the US-China trade war will dissipate rapidly," Hogan wrote. The concerns about trade policy come from a group where 51 percent approve of President Donald Trump's handling of the economy and 32 percent disapprove. How does the Fed process all these crosscurrents? With fewer rate hikes and a bigger balance sheet, according to respondents. Sixty percent still see a rate hike this year, but that's down from 78 percent in the January survey. And now 14 percent forecast a rate cut, rising to 35 percent in 2020. The balance sheet is seen dropping to $3.5 trillion from the current level of around $4 trillion. That's around $500 billion more than expected in January, reflecting recent Fed comments that it would end its balance sheet reduction this year and maintain more assets on its books. The outlook for stocks this year has improved after the sharp sell-off in December, but forecasters haven't recovered all of their optimism. Forecasts for the S&P 500 in 2019 are higher now than in January, but they have only come about 40 percent of the way back from the heady days of September, when respondents expected the index to top 3,000 this year. The S&P is seen rising to 2,861 this year and to 2,925 next year, while the benchmark 10-year yield is no longer seen rising above 3 percent this year.